The intent was good. Replace the old over-the-range microwave along with the new gas stove I was finally getting after my dad put in a gas line to the kitchen. So I took the plunge and purchased both at the same time. I’ve been anticipating their arrival for weeks now and they were finally delivered this morning! I’m a handy gal so decided not to add to the already large purchase by paying extra for installation to be included. I read up on how to remove the old microwave (Google, of course) and had no reservations about taking it out and installing the new one. Unplug the cord, 2 screws from above to come out, pivot forward and then lift up slightly. Viola! Um. Not quite. I had been supporting the unit while K took out the screws from above. But as it turns out it was a wasted effort. That thing wasn’t going anywhere. There were a couple of screws visible from under neath, after removing the bottom panel, but as it turns out they were for the back plate, not to secure the unit itself. It was in tight still, not a bit loose, so we knew there still had to be something holding it securely to the wall. Several google posts later I finally came across something specific to General Electric Over-The-Range Microwaves. Behind the vent above the door there are 2 additional long screws that go the whole depth of the unit into the back wall. IT took pliers to loosen them but they were finally removed. Now we were back in business! The old unit was out. But it was a bittersweet victory because it didn’t take long to figure out that the new unit is a couple of inches deeper and a couple of inches taller. 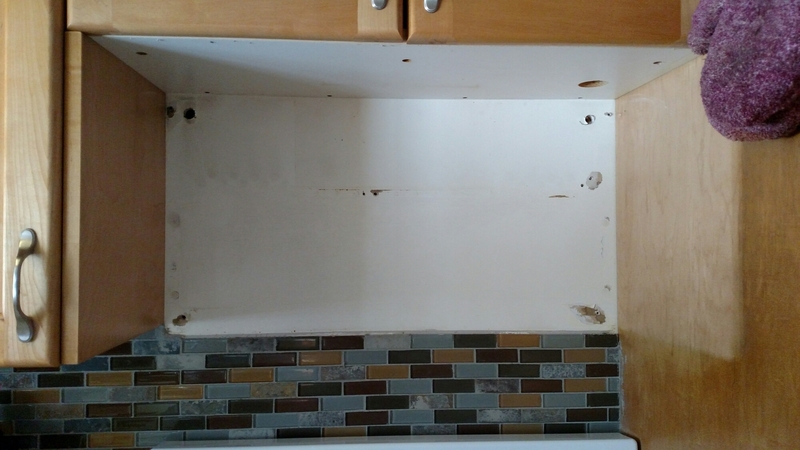 Which means option 1) I keep it, but have to either chisel out the top couple of rows of the backsplash tile work or have to have bring the rest of the wall out slightly so that it is flush all the way up. If I keep it that also means less space between the range and bottom of the microwave, likely eliminating the back ranges from being used for taller pots. And worse still, since the new microwave would come out further (farther?) it may even eliminate larger pots on the front burners as well. Or option 2) return the new microwave and pay a restock fee and a) try to find an over the range microwave that is a bit smaller, closer to the old one or b)build a shelf above the range and get a smaller, countertop size microwave instead. I may get slightly more storage with a countertop unit, but I’d loose the built in vent of those intended for over-the-range. So I guess I have some homework to do. Guess it was a good thing I didn’t pay for installation after all. Otherwise they would have had the new unit in and I would be stuck with it before I really knew if it was what I wanted. Luckily the the gas range will be hooked up tomorrow. Until then it is cold leftovers or takeout. And while I’m deciding it seems the cupboard walls were a bit dirtier than I realized. So it looks like I’ll be doing some deep cleaning tomorrow.